Santiago Quartet is active in the community, working in schools, care homes and for mental health charities. Our education work ranges from introducing primary school children to the music of Latin America to instructing A-Level students on the intricacies of string composition. 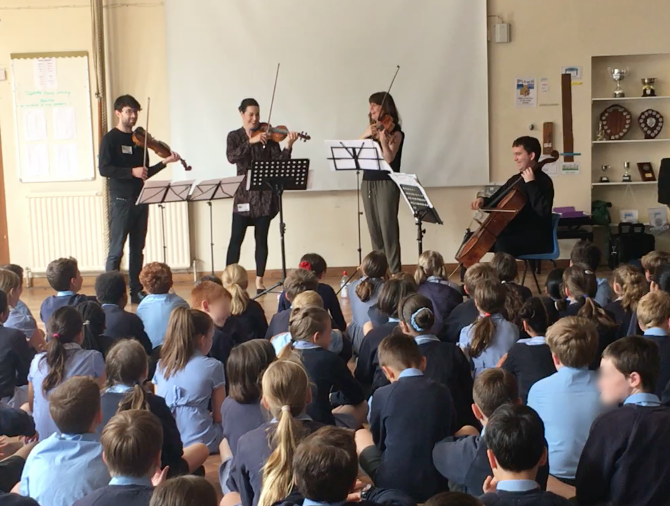 Alongside our on-curriculum workshops, we have also used music and performance to open age-appropriate dialogues with school children about mental health issues. This community work, which happens away from the concert hall but is often integrally linked to our performances, is a significant and important part of what we do. "An exceptionally high quality performance... which received a fantastic response from the residents, their relatives and the staff. We were all mesmerised by the gorgeous sounds. Our expectations were very high... Nevertheless the concert surpassed our expectations... and the home continued to buzz with joy for the rest of the afternoon and into the evening. Our residents spoke with great enthusiasm afterwards. Some said that the Tango music reminded them of dancing at the Locarno Ballroom in Glasgow when they were younger. This was where a few met their husbands/wives. Lovely memories to revive! Our sincere thanks to the musicians..."
"Oakleaf are extremely thankful to Santiago Quartet for choosing to partner with us for this event. Jonny Hennessy-Brown (Cellist and Founder of Quartet), openly spoke about the realities of living with mental health issues... Jonny commented, “I feel it my duty to pass on to others that they can talk about their mental health issues publicly or privately as part of their own recovery process. I am immensely grateful to Oakleaf for the support they provide to a family member who has not been as fortunate as myself ". ...We have raised just over £1100.00 . This money will allow us to continue offering vital support to people living with mental health issues in the community."